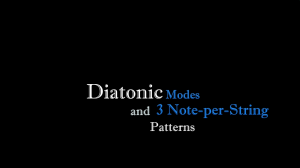 This is a lesson on Diatonic Modes & 3 Note-per-string patterns. I go into detailed explanation starting with Intervals, Major Scale, Relative Minor Scale, Diatonic Modes and 3 note-per-string patterns. Also, giving some tips on how to memorize and how to practice the patterns. In the last chapter I’m covering a topic on how to practice your ear to become more familiar with the sounds of the modes. The file (2,26GB) contains HD video lesson, diagrams and 7 Backing tracks for practicing.